Surrey Conservatives vote to end residential care in all six remaining Surrey County Council care homes. 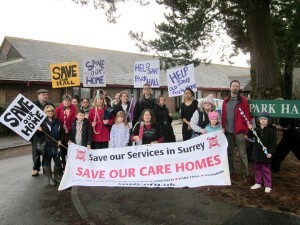 On Tuesday, Surrey County Council voted to end provision of residential care in its last six care homes. These included the Park Hall Care Home in Reigate. The council received two petitions from over four and a half thousand people and their consultation with the public showed 87% of those responding wished the residential care to be retained for many different reasons. I asked questions challenging Surrey County Council’s ending their last residential care provision. The question “How can Council ensure value-for-money for the private sector with the same degree of assurance without the hands-on experience and grasp of costs that comes from running the same services in house?” was not answered. When I asked whether the cost-benefit analysis, which under-estimated bed use, did not value that these sites co-locate residential with other care services, and over-estimated refurbishment costs (and impacts) – which justified the closure would be updated, I was told that, “it is not a financial case” that is leading to these homes being closed. If care really is cheaper in the private sector is that because staff are paid less or care standards are lower? Or if it is the quality of care that is important, much admired in these longstanding community care homes, then why did the question asked as to whether carers will follow those cared for, providing continuity when older people are relocated from their care homes, received no response at all. But it is a private care home (Merok Park) muted as an alternative – not one of these six care homes – that was closed recently by the Care Quality Commission. If the ‘mum’s test’ (whether or not you want you mum to be in the care home) is the guide for quality we should replicate and improve Surrey’s care model, and make this choice available to more people across Surrey. The real reason for this closure did appear to be financial. Outside the meeting pictures of the six care homes were displayed, showing how Surrey had failed to invest in these homes, including basic energy efficiency improvements – which the council cannot afford. Instead, with adult social care carrying a heavy burden of council budget cuts, some of these sites will be used to provide other services (proposals to come back to a future council Cabinet meeting). So at least the council did not decide to close all six entirely. Four of the care homes, including Park Hall, will be retained to provide social care in the community. But still, for me this was soul destroying. When the investment in basic road maintenance is inadequate we resurface roads. When we fail to invest in our care homes they are shut. Yes the roads affect us all but its surely a question of priorities: I stand by those whose care has been cut by the council – whatever you do to the least of us, when we need care, you do to me. This new year Reigate and Redhill commuters were greeted by higher fares, while engineering works until 2018 have led to fewer Redhill trains going to London Bridge. The improvements at London Bridge will improve Redhill’s train service when finished. However, in the short term the service from Redhill has become slower, with trains diverted to Blackfriars and London Victoria – while other routes (such as the East Grinstead line) continue to London Bridge unchanged. The irony is that Redhill and Reigate are already paying over the odds, (compared to comparable rail journeys into London) so this would be an ideal time to freeze prices, while commuters experience increased delays, on a daily basis. The engineering works could have been the excuse for fairer fares. Instead train fares have continued to rise even as the engineering works leave a poorer London service for the next few years. Jonathan Essex told the local website reigate.uk that the Government had to act to ensure that commmuters are fairly treated. He said “If our train service from Redhill to London Bridge was cut like this for just one day passengers would be compensated. Now this happens every day with Southern Trains new timetable penalising Redhill over all other routes.” “The government must ensure that passengers are compensated now”, he added. The AGM of the Reigate, Redhill and District Rail User Association is from 7.30pm on 12 March 2015 in the Harlequin Theatre in Redhill. This is our opportunity to hear from and speak directly to representatives of Network Rail, Southern and Thameslink (now both part of the Govia Thameslink Railway Ltd, the UK’s largest train franchise). You can join as a member and attend the meeting for £3 on the door.